One of the advantages of these binoculars from Leica is your ability to upload and calculate your ballistics information. This is always helpful for hunters who will benefit from knowing what works in specific situations. There is an online calculator customers can take advantage off, and the information can be loaded onto a micro SD card. There is a small waterproof slot on the side of the binoculars so you can easily slip the SD card in to have all of the calculations at your fingertips. What really makes the Geovid HD binoculars stand out is the ABC system which gives you three distinct points of reference. When you need to make corrections for distance viewing to ensure a perfect shot you can easily make adjustments in centimeters or inches. The system is also able to provide you with an accurate horizontal range which is ideal for ensuring the cartridges and rifle being used are the correct combination. This helps make each shot count and reduce the number of wasted cartridges. You can even calculate the air temperature and pressure, along with the incline so it is easier to hit your target the first time. Experienced hunters know that there will be times when they need to be able to make distance shots, and these binoculars make this possible. The wide viewing angle ensures that you can clearly see the area around you, and these binoculars also have an impressive range. With the ability to see prey up to 1,000 yards away you can be the first in your group to spot a potential target. The multi coated lenses also provide you with crisp, clear images even in low light situations. The prism design also ensures that details are sharp and colors are true to life, which is always an advantage when you are hunting for game in the thick brush. The last thing you want to worry about when you are out in the field is comfort, and this even applies to your binoculars. Leica has designed this pair with an ergonomic grip that is comfortable to hold for extended periods of time. This is especially important considering the heavier weight of the binoculars. The curved chassis is designed to be comfortable to grasp, and to provide you with a secure grip even when your hands are wet or sweaty. This allows you to quickly grab and hold the binoculars when something catches your attention at a distance. With the ability to always be able to grab your binoculars you never have to worry about missing a potential target. Binoculars need to be durable in order to withstand the rigors of hunting, and this is not a problem for this pair. Leica understands how important it is to have a pair of reliable binoculars with you when you are hunting, and these are designed to last. The sturdy casing is capable of surviving the occasional bumps that are common out in the field, and housing is constructed from rubber coated magnesium. Attached caps will protect the eye pieces when the binoculars are not being used, and you will also appreciate the nitrogen filled lenses. This prevents moisture and fog from clouding your vision, and it also ensures that the lenses are waterproof. Hunters will love being able to load their ballistics information into these binoculars. Compensate for incline, temperature and other factors with the ABC system. With the wide viewing angle, Leica has designed a pair of binoculars that will let you sight prey from an incredible distance away. These binoculars are designed to be comfortable to grip, which is always an important consideration when you are out in the field. You will also appreciate the durable construction that is designed to withstand almost any environment. 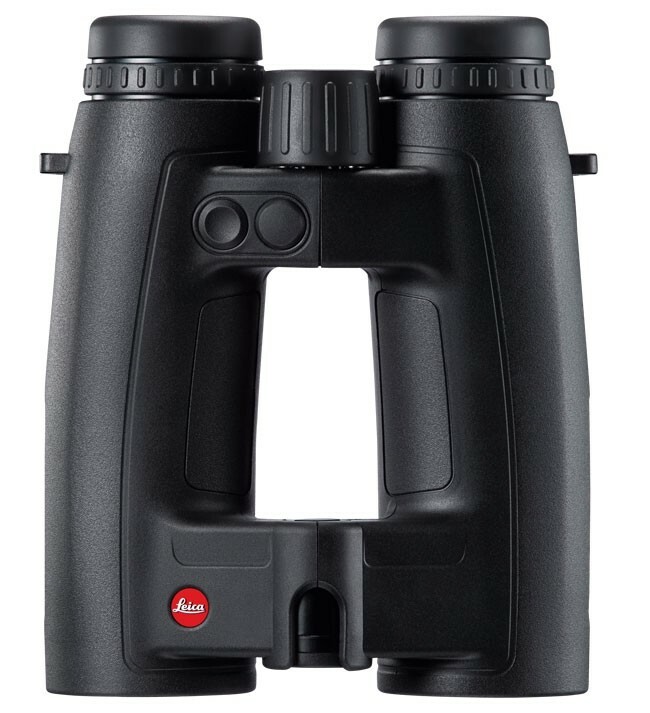 It should be noted that these binoculars from Leica do weigh more than similar models, but this is often overlooked once consumers realize all of the extra features that come standard with this pair. While the Geovid HD-B binoculars are priced higher than other models, it is well worth the extra cost when you considered the included features. The ABC system helps ensure that your rifle and ammo are the correct match for the setting, and you can even keep your calculations close at hand with a convenient micro SD card. Make minute adjustments for incline, temperature and distance so every shot hits the target exactly where you want it. The binoculars are also designed to be comfortable to use, despite being slightly heavier, and the curved chassis ensures that this pair fits securely in your grasp. The durable construction is designed to last through years of hunting trips, and you will also appreciate the binoculars’ sleek appearance.